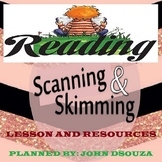 This PowerPoint teaches students what skimming and scanning are. 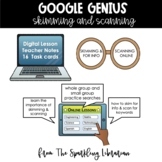 It then provides 3 texts (2 information reports and 1 narrative) and asks them to use their skimming and scanning techniques to answer a few questions. Skim a text, scan a text, synthesize... great strategy to teach children when working with a non-fiction text. helps students practice skimming and scanning skills on the theme of Volcanoes. This unit includes 5 articles. 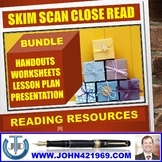 These are a set of handout and resources that can be used for any non-fiction text (I use it with our Social Studies textbook) as a way to teach skimming and scanning. 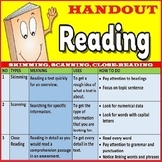 A complete 4 week program to guide your students in the skills of Skimming and Scanning. Includes a checklist, table of contents and topics like setting goals, shoulds teens work, personal finances, natural disasters, public speaking skills and how to stay awake during school.